We accept Paypal payments and credit card payments via Paypal. Do you live in New Zealand? Email me to arrange payment by bank transfer. All items must be paid in full before shipping. 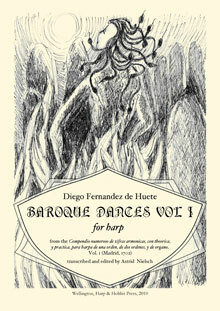 A popular selection of easy to medium difficulty tunes for harp or other instruments, and/or singers. Original texts are given for most songs. 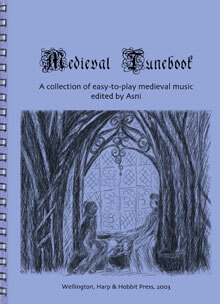 Includes an introduction to arranging medieval tunes for instruments. Transcriptions from the "Compendio numeroso de zifras harmonicas, con theorica, y practica, para harpa de una orden, de dos ordenes, y de organo", vol. I, Madrid 1702. The treatise by the cathedral harpist from Toledo is the most extensive historical source we possess for harp music before 1800. Suitable for more experienced players. Variation sets and baroque dances. The pieces are suitable for single row and chromatic harps, lever or pedal harps or keyboard instruments. With an introduction by Astrid Nielsch. Harp & Hobbit Press, 2013. A4, spiral bound, cardbord cover. Suitable for more experienced players. 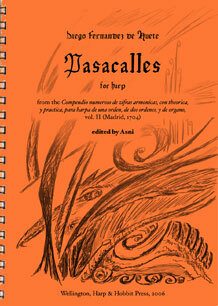 Six elaborate variation sets on old Spanish dances: Gallardas, Españoletas, La Tarantela, Las Vacas, and two Pasacalles. The pieces are suitable for single row and chromatic harps, lever or pedal harps or keyboard instruments. With an introduction by Astrid Nielsch. Harp & Hobbit Press, 2011. A4, spiral bound, cardbord cover. 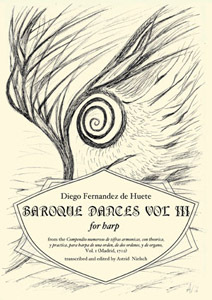 A transcription of the harp tablatures from the 1677 collection of Spanish dance music, with an introduction to Spanish baroque harp technique and the Spanish dance repertory by Astrid Nielsch. Easy to medium difficulty. Suitable for chromatic harps, lever harps, pedal harps or keyboard instruments. Suitable for beginners. These simple, upbeat Spanish country dances are suitable for both single row and chromatic harps, lever or pedal harps or keyboard instruments. With an introduction by Astrid Nielsch. Harp & Hobbit Press, 2010. A4, spiral bound, cardbord cover. Transcriptions from the "Compendio numeroso de zifras harmonicas, con theorica, y practica, para harpa de una orden, de dos ordenes, y de organo", vol. 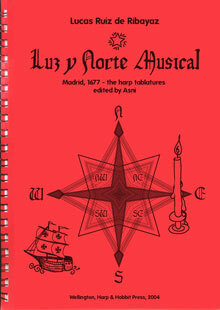 II, Madrid 1704 The treatise by the cathedral harpist from Toledo is the most extensive historical source we possess for harp music before 1800. Medium to advanced difficulty. 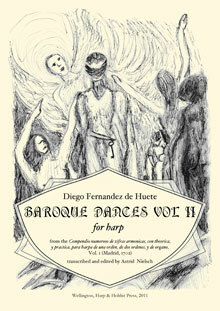 This sophisticated high baroque repertory is suitable for chromatic harps, pedal harps or organ. With an introduction by Astrid Nielsch. Harp & Hobbit Press, 2006. A4, spiral bound, cardbord cover. 29 pages. 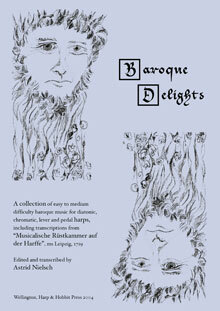 A collection of easy to medium difficulty baroque music for diatonic, lever and pedal harps. Contains transcriptions from the anonymous harp music manuscript "Musicalische Rüstkammer auf der Harffe", Leipzig 1719, and a collection of pieces suitable for harp by composers including J.S. Bach. G.F. Handel, H. Purcell, G. Caccini, T. O'Carolan, Ruiz de Ribayaz, and F. W. Zachow. Shipping & handling for all sheet music books: € 4.00 to anywhere on the planet. Items are usually shipped within 48 hours. International delivery times may vary — typically 1-2 weeks to the US, Canada and most European countries. Customers in New Zealand qualify for local shipping rates - please email me to arrange your payment.